To purge the old data, login with the MASTER user ID and close any windows. If you are using LimoWiz network version, also make sure all other users are out of LimoWiz and to not login back until process is complete. If you have a network version of LimoWiz, perform the purge process on the Server; it will be much faster than a workstation. Backup data first before proceeding. Use the Backup button on top toolbar. 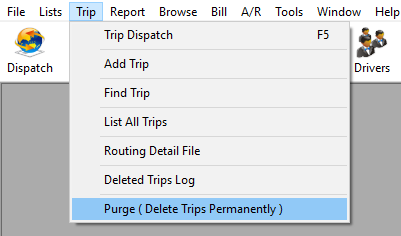 You can also use the Purge Blank Trips Only and Pureg Trips with Blank Dates ONLY after you're don purging to remove orphan records. Note: The removal process can take some time depending on the speed of the computer and number of trips and other related records. After process is completed and click the window X button to close it, you will be prompted to Index and Compress; Click Yes.